Puppies and Christmas just seem to go together. 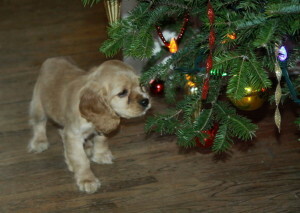 Everyone has the idea of the perfect present; the wriggling whining puppy voice in the box under the tree. The excited children, squealing as they open the most wonderful and exciting gift. This video is really cute, with adorable little puppies, playing happily in the boxes and wrapping paper, and then falling asleep “just so”. Definitely a cute video, one to watch over a few times! They are just the most perfect Christmas puppies! Have you given any thought to what happens after the present is opened? Is the house puppy proof? Are there family meals, visits, get-togethers to go to, or all the excitement and activity in your own home? Have you thought about the potty accidents, the chewing, the crying, all the trips in/outside for bathroom breaks? 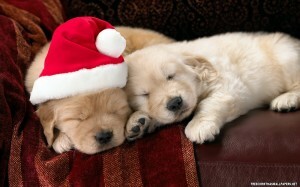 We at Curious Puppies know how exciting it is to have puppies around over the holidays. Christmas is a special time in our home, with lots of Christmas decorations around, and of course a great big real tree! It is important to plan ahead and make sure your home is ready for your little surprise.It is really important to us that no puppy is ever given as a surprise gift to a home that may be unwilling, unable or unprepared to take on this 14+ year commitment. 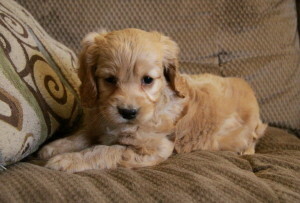 So here are some ways to help make you successfully bring home a puppy for Christmas. How much time do you have to spend with your puppy on Christmas Day? 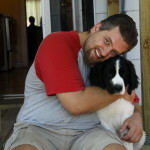 It isn’t important that you take 2 weeks holidays from work to spend 24/7 with your new puppy. You will however want to make sure that Christmas Day (or whatever day you bring your new puppy home) is relatively quiet and you have adequate time to spend with him to help make the transition smooth. You will need to take your puppy outside multiple times in the day, so be prepared that if you have a very busy Christmas Day, this may not be the best time to bring home your new puppy. At Curious Puppies we advise people to bring home a puppy about a week before or after Christmas, or whatever your most busy time is. 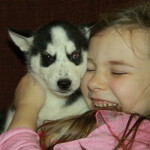 This will give you a few days to get the puppy used to you and his new home. Bringing him home with too much excitement can be hard for a little puppy to adjust, and he may just want to hide away in his crate or behind/under something. 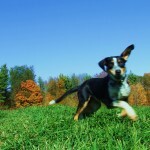 It is important to cause your puppy the least stress possible for a smooth transition. Remember, he has just left his siblings, family, and everything else that was familiar to him. No matter how amazing his new home, it’s different and new! What items do you need to have ready in your home? We always recommend crate training as the fastest and easiest way to train your new puppy. We do not recommend pee pad training. Therefore a good strong crate is important. 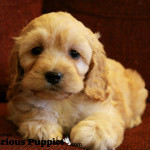 Our most common breeds are cockapoos or goldendoodles. Cockapoos would use a 24 inch crate, while the goldendoodle would do best in a 36 inch crate. 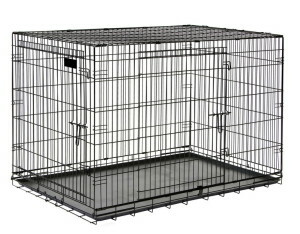 Other breeds will vary in recommended crate sizes. Always have a large variety of puppy safe toys around for the puppy to teeth and chew on. They are going to chew on something, so it’s best to give them something safe! 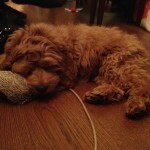 They like things such as rope toys, blankets, squeaky toys, hard toys, balls to chew on and chase, or soft toys. The more they have to chew on that is ok, the less they will want to look for something that will get them into trouble! Good quality food and water dishes are a must. Make sure they won’t tip when the puppy climbs on them, because they will try! A puppy bed is certainly nice for them to enjoy a comfy place to sleep near you while out of their crate. A good quality leash and collar are highly recommended. 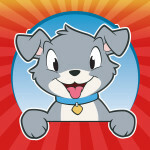 It is a good idea to measure your new puppy’s neck before buying a collar, or take your puppy into the store for sizing. 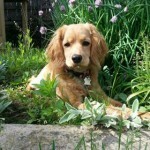 It is not recommended by trainers to use harnesses or retractable leashes for training your puppy. High quality food is recommended. 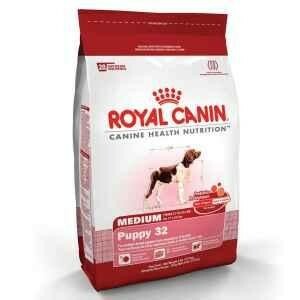 We feed our puppies Royal Canin, which can be purchased at most pet stores. Merry Christmas to You and Your New Puppy! The most important thing when bringing home your puppy, whether for Christmas or any other time, please make sure it is a well thought out decision and not a spontaneous one! We do not want any puppy or dog to be given as a surprise gift, if the person receiving the puppy is not prepared or able to care for the puppy! We too often see puppies advertised as “great gift” for whatever the current season is. It is a sales ploy, nothing more. 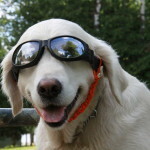 Please be aware of this, and make sure that wherever you adopt your new puppy or dog from is a loving and caring place, with all the proper care given to the dog on schedule (such as vet care, needles up to date, dewormings, high quality food etc) and that you feel confident that the dog is happy and well loved where he is. 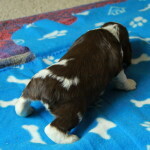 Also, never fall for the “ready to go” ploy when the puppy is under 8 weeks old. If in doubt, walk away. Make sure you ask lots of questions and are able to visit as long as needed. 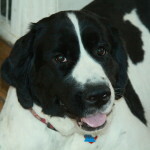 You will be happy you did once you go home, and have a happy, well adjusted, healthy wonderful new puppy! 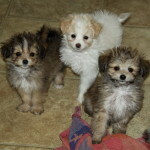 Cockapoo Puppies and our “From Puppy to Dog Training” Course!